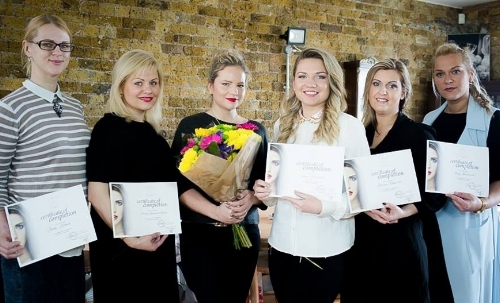 Zydre Zilinskaite is providing a variety of makeup courses and seminars. She has educational programs for both personal use makeup application and for students who are seeking a career as a makeup artist. During the intensive pro- artist courses students get the fundamental knowledge of makeup application, following with hands on practice. Classes include learning a bridal, special occasion and creative makeup, color theory, skin care, also makeup application for different ethnicity's and ages. Zydre gives students the confidence to work with clients, and the insight information about finding work and the industry. One day masterclasses or one to one training available. Makeup products are provided during the course. 1 to 1 and group training available. Portfolio building days on demand. Intensyvūs 5 dienų PRO- MAKE UP ARTIST makiažo mokymai, skirti būsimiems vizažistams Lietuvių kalba Londone! Kursų metu dirbsite tik su geriausia, kruopščiai atrinkta, garsių gamintojų kosmetika (MAC, Urban Decay, Illamasqua, Inglot, Make Up For Ever). Makiažo priemonės kursų metu yra suteikiamos. Kursų pabaigoje išduodamas sertifikatas anglų kalba. Būtina išankstinė registracija. Vieta rezervuojama tik pervedus depozitą. Skubėkite, nes vietų skaičius labai ribotas! 5. Tinkamos kreminės pudros ir maskavimų priemonių parinkimas. 20. Makiažo industrija ir darbo galimybės. Trukmė nuo 10 iki 17 val su pietų pertrauka. Kursai trunka 5 dienas iš eilės. If you are interested in learning and perfecting makeup techniques for your own personal application, or what makeup enhances your beauty the best, Zydre's makeup lesson is a perfect choice. Tea/ coffee, soft drinks provided. Zydre is available for personalized makeup lessons for corporate events.